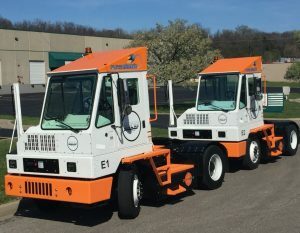 Nolan Logistics Launched Electric Yard Truck Operations with Orange EV’s T-Series. Shown here Nolan’s E1 and E2. “We’ve been a long-time operator of electric vehicles and were early fans of Tesla, Nissan for their Leaf, and now Orange EV”, said Nolan. “Nolan Logistics has been investing to grow its fleet of heavy duty electric vehicles to better serve our customers while doing the right thing for the environment. Stricter air quality rules, purchase incentives, strong and growing concern for the environment, and the simple economics all make a very compelling case for going electric.” The terminal truck fleet (aka spotters, hostlers, switchers) is the heart of Nolan Logistics which owns, maintains and operates trucks at customer facilities, often larger consumer brands. Nolan Logistics enables manufacturers, distributors, third party logistics providers and others to outsource their spotting operations and better focus on the core business. Nolan Logistics offers a unique approach to yard management with shuttling and spotting services honed over 30 years in the industry. Growing quickly from regional roots to across the country, Nolan owns, maintains and operates terminal trucks enabling manufacturers, distribution centers, 3rd party logistics providers and others to outsource yard management and focus on the core business. Contact Nolan Logistics at info@NolanLogistics.com and 800-928-7556, or visit the company’s website at www.NolanLogistics.com. Kansas City based Orange EV is the leading OEM providing heavy duty electric vehicle solutions to industrial fleets that do the same work while eliminating diesel fuel and emissions. Building both new and re-powered vehicles, Orange EV was the first to commercially deploy 100% electric Class 8 electric vehicles into container handling operations. Orange EV’s terminal truck was the first approved for sale as a heavy duty electric vehicle in California. Contact Orange EV at Sales@OrangeEV.com and 866-688-5223, or visit the company’s website at www.OrangeEV.com.